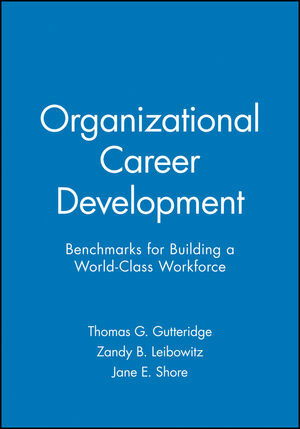 Based on an American Society for Training and Development-sponsored survey of career development practices in over one thousand large companies in the United States, Europe, Australia, and Singapore, Organizational Career Development summarizes the state-of-the-practice in the field. The authors and their fellow contributors go beyond a general look at career development systems to offer nuts-and-bolts advice for designing and implementing programs. THOMAS G. GUTTERIDGE is dean and distinguished professor of management at the School of Business Administration, The University of Connecticut. He is also coauthor of Organizational Career Development: State of the Practice (ASTD, 1983). ZANDY B. LEIBOWITZ is a psychologist and principal in the Maryland-based consulting firm Conceptual Systems, Inc. She is also author of Adult Career Development and coauthor of Designing Career Development Systems (Jossey-Bass, 1986). JANE E. SHORE is a senior career development consultant with Fannie Mae. In 1991 she received the American Society for Training and Development's Career Development Student Research Award for her research in organizational career development. "Destined to be a classic in the field."